Being the market leader, we are building Rubber Grommet. These products have excellent quality, reliability, strength and fullness. Rubber Grommets When wire, tube and other items are inserted through the hole in metal, plastic or other hard materials, then protects from friction damage. To provide a defect free range from us, the entire range of products is properly inspected on many parameters. These products are made from high quality rubber, which ensures temperature resistance and its strength at the end of the customer. We are a leading manufacturer of Rubber Grommet from Pune, Maharashtra, India. In a series of bonded parts of metal from rubber, we manufacture and supply a wide range of Rubber Grommet to meet the needs of our customers. With a broad business understanding of this scope, we are involved in presenting a comprehensive consignment of Rubber Grommet. Received as one of the leading organizations in the industry, we are engaged in providing high quality Rubber Grommet. 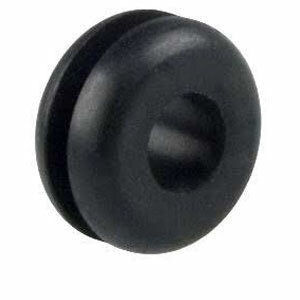 We are the renowned manufacturer and supplier of Rubber Grommet in Pune, Maharashtra, India. These rubber grommets have a high melting point and it can also bear high temperature and pressure. These rubber grommets are used for long life and durability for UV tests. Our products are lightweight in weight offering and can be customized. These products are widely used in drip irrigation and it is appreciated by our customers. Apart from this, the products can be easily availed from us at the most reasonable market value. Our products are available in different sizes and sizes, so we are able to meet all the requirements of the customers.